The book J.T. is about a boy who found a cat in the alley and he took care of it. When he found the cat, one eye was badly hurt. He’s very poor and he lived with his mom. When he found the cat, he takes care of the cat more than he gets in trouble. My favorite part is when he built the shelter for the cat to keep the cat warm. When the wind blew the cat shivered convulsively each time. After he built the shelter, the cat got warmer. My other favorite part is when he stole the radio. I like that part because he always wanted a radio but they don’t have money to pay it, so he finally got it. I would recommend this book for 3rd and 4th graders. 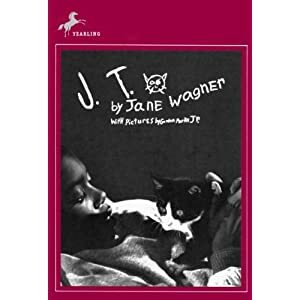 I also think all animal lovers will like this book because it’s about a boy and a cat. They will enjoy reading it and will also enjoy looking at the pictures.